There are few strategies more effective than using everyday vehicles to advertise your business. That is the goal of commercial wraps. The concept is to have graphics designed to fit your branding and company image. 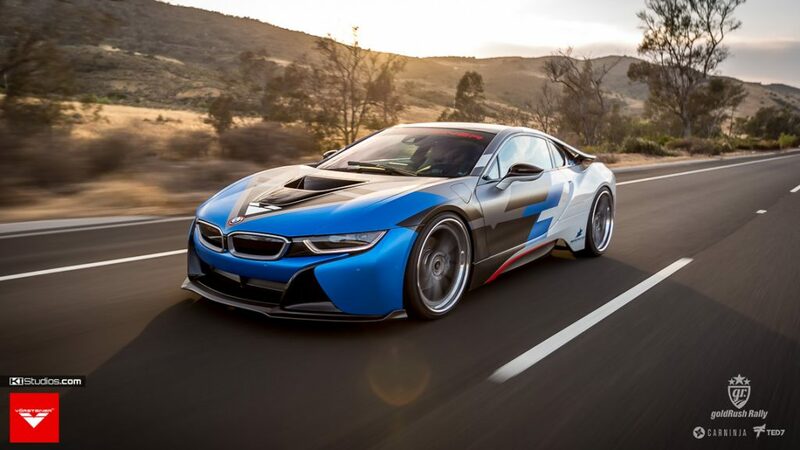 Once the design is complete, the chosen vehicle or vehicles are wrapped with the graphics. The result is mobile advertising that happens while you or your employees do what you already do, drive. 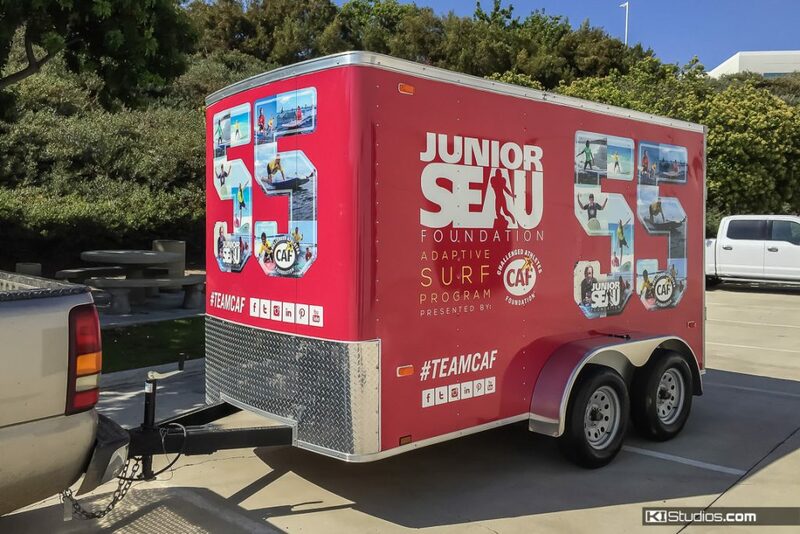 We found that the biggest need in the commercial wraps industry is the design. It’s actually the hardest part of the entire process. It requires the most experience and expertise in both visual design and correct fitment over a 3D object, which is the vehicle. Not everyone can do both those things well. The second most important aspect of a commercial wrap, following the design, is the print. There are plenty of qualified installation facilities around the United States and the rest of the world. However, many of them are not experienced in design. Additionally, most of them don’t have the equipment necessary for the large scale prints needed for a commercial wrap. For that reason, we focus on the design and printing of commercial wraps. At KI Studios we work with clients to conceptualize and create a design. Then we print the wrap, put it in a roll and ship it out. This means you can be anywhere in the world and still be able to get a KI Studios design. You just have to make arrangements for a local wrap shop to install it for you. Having your commercial vehicles wrapped is the next logical progression to buying fleet vehicles in the first place. A commercial car or truck is already a substantial investment, might as well make the most of it. Process of wrapping a Ford F250 with a fully printed commercial wrap. Besides, your commercial vehicle can provide a service while at the same time promote your business to achieve more sales. That is truly the way to maximize your invested dollars. Even if the target for your vehicle wrap is not to generate direct phone calls, brand awareness can be a powerful tool. You can have vehicles driving around with your logo on it just for brand recognition. It’s very simple actually. Next time a person is faced with the decision between buying one of two products placed in front of them, they will pick the one with the logo they recognize. This sort of brand awareness happens through repetition. Showing off your company’s branding out on the street on a daily basis is one way to achieve this. Not all commercial wraps look commercial. Exotic car commercial wrap. Brand awareness can go a long way in strengthening direct sales as well as indirect sales. A commercially wrapped vehicle helps legitimize your business. Let’s assume you have a small business or you run a one-man service. Meaning, you have just one vehicle in your fleet answering house calls for handyman work or plumbing. Which do you think customers would be more comfortable receiving at their homes? A plain white suspicious-looking panel van or an eye-catching commercial van with graphics, company logo, phone number and address? That’s a no-brainer. The commercially wrapped vehicle will win every single time. Imagine if FEDEX was delivering packages in unmarked white vans. Would anyone open their doors to them? You don’t have to be a large business. The rules are the same. Food trucks are ideal subjects for commercial wraps. Customers will feel a lot more comfortable doing business with a person or company that sends out all the right signals of legitimacy and professionalism. If your price is right and you look more professional than the next guy, you win. There is a reason large corporations use commercial wraps for their service, sales and delivery fleets. Commercial wraps work! The advertising wrap doesn’t necessarily have to be complicated. Some of the most effective ones are simple. Think UPS brown delivery trucks, Amazon delivery vans and Direct TV service vans. Simple, yet effective. Other well-known wraps from large fleets are quite more elaborate. Some of these brands include the likes of Bud Light and UHAUL. Then there are those in between, like SERVPRO, whose vehicles are fully wrapped and have text throughout, but don’t do the big and embellished full color designs. These big brands know how effective commercial wraps are for their companies’ bottom lines. However, you don’t have to be a big business to benefit in much the same way. You can do the same thing, only scaled down. Instead of 100 commercially wrapped fleet vehicles, you could do just 10, or just 1. The benefits are the same, just the scale is different. KAABOO Del Mar Music Festival promotional vehicle. There is no question as to the effectiveness of commercial wraps. Your commercial vehicles are already driving around town showing nothing more than a nice coat of whatever paint color you chose when you bought them. Make your vehicle dual purpose today. A service vehicle and an advertising machine, in one. Have your investment dollars work harder. Have your commercial truck, van, SUV or car wrapped today. Get your commercial vehicle wrapped today! 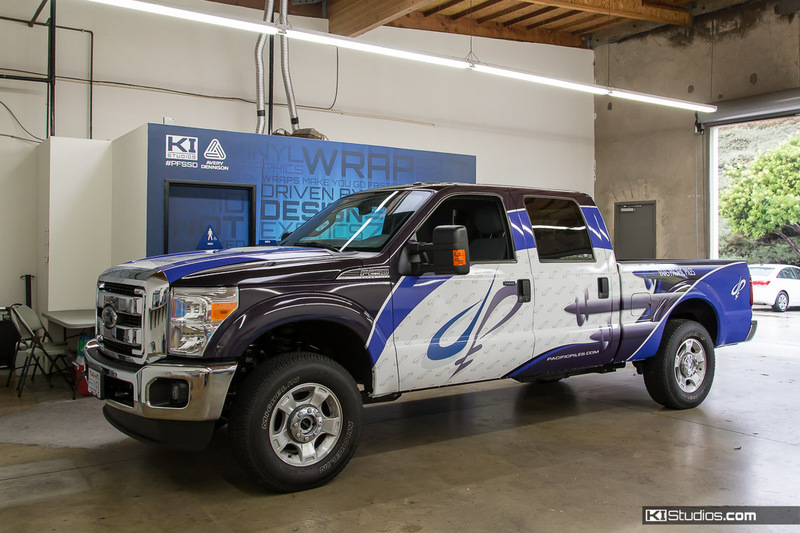 At KI Studios we work with you to create a compelling commercial wrap design that attracts attention. That way, you don’t have to worry about the design part, or any other part of the process for that matter. Once designed, we have the equipment and experience to make it happen. We print all commercial wrap designs in-house, no matter how big. Finally, once the full design is printed, we pack it up and ship it to you or your local wrap shop of choice for installation. 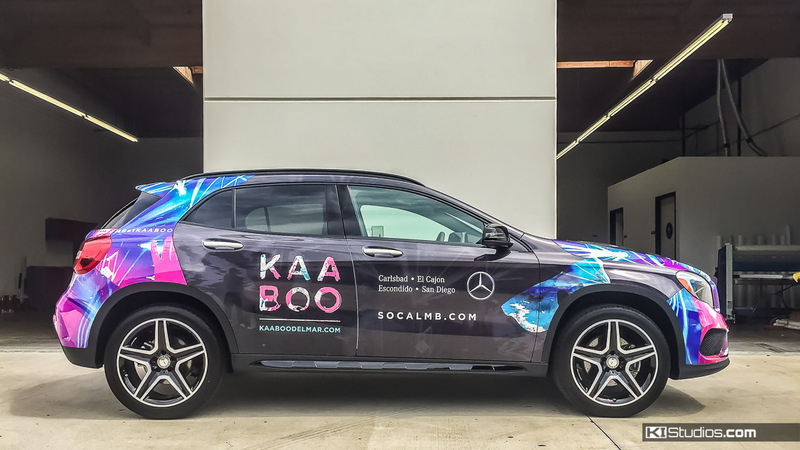 Check out the process of wrapping a Mercedes-Benz GLA 250 for the KAABOO Music Festival of Del Mar promo vehicle. 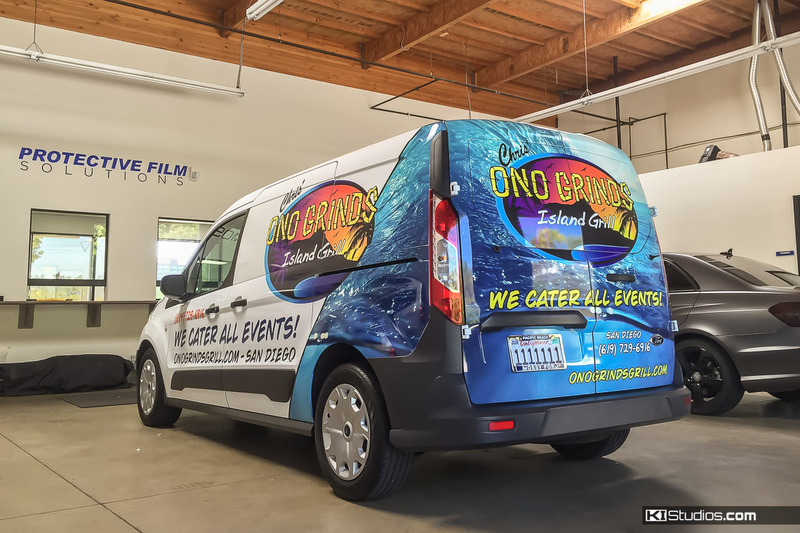 The design and print is the most crucial aspect of a commercial wrap. Feel free to contact us for a free quote for design and printing. We can also quote shipping at the same time.